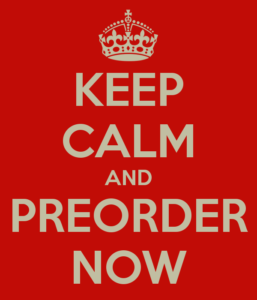 We can take pre-orders for nearly anything you are eager to snag; just let us know. We family-owned and operated, indie bookstores may not be super high-tech but we are what Leonard Sweet once called “high-touch.” We use the internet — sure — and I’m on-line a lot. But we give that personalized service that is as close as face-to-face real as we can get. (Apologies to my Lutheran pastor pal who put with with Epiphany jokes today as I answered her questions about getting books quickly. I’m glad she got it when I said her group finally saw the light.) So, ya want something? Give us a shout! Considering ordering something? Let us know how we can help. Wonder about a book you’ve heard about — maybe we can tell you more. Unless it is some super funky self-publisher who doesn’t deal with stores, or a sectarian publishing house that doesn’t offer wholesale prices to real stores (like LifeWay) we say we can get almost anything. Here are just a couple of titles that are building a buzz this month. We are familiar with the authors and/or books in each case and highly recommend them. Get ’em on your list and we’ll send them out as soon as they are released. We may be in small-town central Pennsylvania, but we often get things before the big chains. We’re happy to get these forthcoming titles to you as soon as they become available. ALL ARE 20% OFF THEIR SUGGESTED RETAIL PRICE. I have chatted with dear Margaret from time to time and so appreciate her joy, her hope, her deep commitment to finding God in the real world. You may recall a review we did here once raving about her book Wonderstruck that, in memoir-like fashion, almost, told of her journey to be struck afresh by the glories of God by paying attention to the goodness of creation. 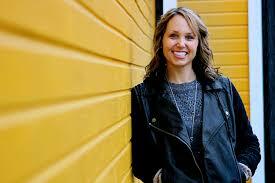 Her book Fight Back With Joy tells of her effort to share joy during a very, very hard time in her own life. Margaret Feinberg is an adventurous person and a good writer and has done this kind of book before — an earlier one called Scouting the Divine: My Search for God in Wine, Wool, and Wild Honey explored those ancient occupations and what they teach us about the God of the Bible. 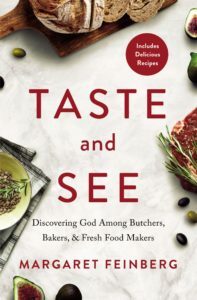 In this new one she will be looking at the whole “foodie” phenomenon, telling of her journeying around the world in this “culinary study of Scripture” and visiting olive growers, fruit farmers, butchers, potters. Does God have a foodie focus? Will paying attention to artisanal food sources offer insight into how we read the Scriptures? What might happen — to our faith and our own food tastes and dining practices — if we see God as the Executive Chef of the Universe? How does feasting help us savor life and understand embodied, real-world faith? This is fun stuff and, frankly, not frivolous. How we embody our life in God’s good but broken world is of urgent importance and we don’t often hear about such a quest. We’re excited to see this fresh, new book. 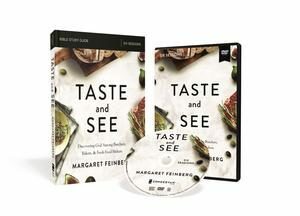 We already have the delectable six-week Taste and See DVD curriculum ($41.99 includes the DVD and one partipants guidebook; OUR SALE PRICE = $ 33.59) which could be a fun treat to use with your small group. You might have to forego cheap chips and soda for your Bible study snacks, but this could be fun. We recommend the book and the DVD, too and give a hearty shout-out to the always generous Ms. Feinberg for offering this whimsical, good, work to us all. This trim volume (192 pages) is easily worth twice the price and I, myself, am on my second time through reading an early, advanced manuscript. Mouw is a hero of mine and we have many mutual, dear friends. (I was so, so happy to see him appear from time to time in the recent memoir by his philosopher-scholar colleague Nicholas Wolterstorff which is called In This World of Wonder: Memoir of a Life in Learning.) Dr. Mouw is a reasonable, clear-headed, open-minded, generous, Dutch Reformed, Kuyperian, PC(USA) evangelical who is active both in the world of scholarship — just for instance, he has thought so much about this that he has a small collection of inspiring pieces called Called to the Life of the Mind: Some Advice for Evangelical Scholars — and in the broader world of theological studies. (In fact, he wrote his own memoir, less a full autobiography, but a memoir-like set of reflections about his own academic journey, the issues he has attended to, the reception he has gotten as he has spoken his evangelical mind in a real variety of settings. 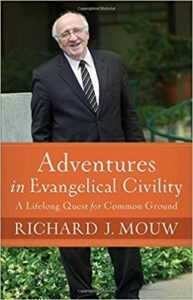 As the retired President of the world’s most multi-ethnic and trans-denominational seminary (Fuller) he obviously has been in the thick of all kind of conversations and his memoir, Adventures in Evangelical Civility shares not only his academic and social interests but how he tried to live out of a posture of civility. His wonderful Uncommon Decency is a call to Christian civility and his Adventures in… is his own story of being a leader who majors in that theme. 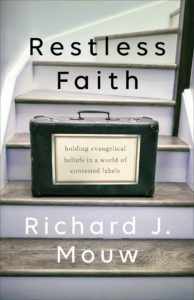 The forthcoming Restless Faith: Holding Evangelical Beliefs… is a bit more of the same and, as I’ve noted, I couldn’t put it down and am taking great pleasure in re-reading it. It is on a topic (well, it’s on a lot of topics, actually) that is important to many of us; namely, our relationship with the broader evangelical movement and the very word itself. Is the label “evangelical” worth keeping (and who gets to use it)? There is one very good collection of essays about that topic (see Still Evangelical? : Insiders Reconsider Political, Social, and Theological Meaning edited by Mouw’s good friend and successor, Mark Labberton) but we need more. And this is a truly lovely, thoughtful, honest, reasoned account of why Dr. Mouw — even with a bit of restlessness about it — still wants to call himself an evangelical. Look: Rich admits (and has some nice stories about it in this restless memoir) that he has always been a bit restless about the phrase and all it entails. At its best, the term communicates much about his own faith tradition and about the theological and spiritual truths and impulses that he thinks we need to affirm and experience. But, as we all know, evangelicalism has rarely been at its best and often is a hot mess, theologically, institutionally, and especially in terms of its social and political and culture witness. If mainstream evangelicalism has not been entirely seduced by the far right and Trumpian politics (as I maintain, by the way, that it mostly has not) it is because of, in part, the moderating voice of Rich Mouw and others in his movement. Richard Mouw candidly reflects on wrestling with traditional evangelical beliefs over the years and shows that although his mind has changed in some ways, his core beliefs have not. He contends that we should hold on to the legacy that has enriched evangelicalism in the past. In a way, Restless Faith is nearly another memoir like the fascinating Adventures in Evangelical Civility (it is conversational in tone with good stories and ruminations) but in it Mouw shows not just that he wrestled with other views with passionate but civil tones, but how he has come to grapple with issues that plagued him, topics that we must think about, issues that must be resolved within the broader church and within thoughtful evangelicalism. Mouw can do some very heady scholarship and some of his work in social ethics have been very well received within the scholarly world. But this is perfect for those of us who are “armchair theologians” and activists of a rather ordinary sort. I will write more about this great book later, after it releases, as I’m sure it is a book we will want to tell many about. His own willingness to be a bit “restless” in holding his own convictions lightly, and offering a “lovers quarrel” with the church is a model for all of us. He is fair and honorable and wanting to be clear about the first things of the gospel. And he is willing to critique and challenge and ponder and hope for change in other matters. 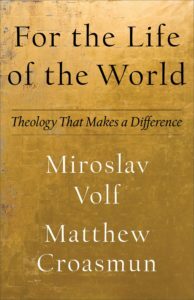 He’s one of those guys who, with a Reformed, worldviewish sort of accent, insists that we live by that Moravian slogan, “In essentials, unity; in non-essentials, liberty; and in all things, charity.” This is a good introduction to what he thinks are the most essential truths of faith and the most important insights of the evangelical tradition. I know it would be different in other circles but for what it’s worth, I think among many of our social-media friends and customers, there is more of a buzz about this forthcoming book than nearly any other title this season. We are eager to sell it, and hope many will consider pre-ordering it now. In fact, now, if you pre-order, you can get some extra digital content at his website by showing your receipt from us. 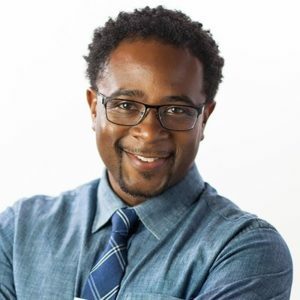 Tisby is an impressive speaker, has presented at national conferences, and has penned eloquent, intelligent pieces in significant outlets such as The New York Times and The Atlantic. He is president of The Witness: A Black Christian Collective where he writes about race, religion, politics, and culture. Perhaps you have heard him as the cohost of the Pass the Mic podcast. He has a BA from Notre Dame and an MDiv from Reformed Theological Seminary (and doesn’t that just make him that much more interesting.) As a PhD candidate studying history and social reform movements of the twentieth century, he is increasingly becoming an expert in this space, offering an historian’s eye, even if he is writing about the rise of the religious right, the “new Jim Crow” or racial reconciliation in the age of #blacklivesmatters. There are many broad histories of the atrocities against people of color; the classic Before the Mayflower by Lerone Bennett reminds us that slaves were brought to the shores of North America before The Mayflower. Books like Forgive Us: Confessions of a Compromised Faith (by Lisa Sharon Harper, Mae Cannon, Soong-Chan Rah, and Troy Jackson) give us passionate critique of compromised faith and serious complicity in injustices of various sorts. 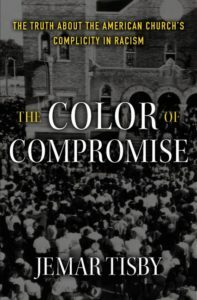 Of course we have dozens of such books in stock and even more on the project of enacting racial justice and finding racial reconciliation and equality. In my reading in this field, I think I can say that this book fills a much-needed gap and is an excellent resource to fill this niche. We need a solid history that isn’t dry or tedious but that is more than polemical. We need a careful excavation of the roots of the sustained injustice in the American culture and church. Some have said some of this book is chilling; the gross injustices are not easy reading. Given that there has been an inadequate response from the church — particularly the large evangelical church — we need to continue to learn, to be informed, to study well ups and downs of race relations in the US. Tisby does more than diagnose the problem. He charts a path forward with intriguing ideas that further the conversation as he challenges us to reverse these patterns and systems of complicity with the world. Some have said this book offers a bold, courageous call for immediate action. Let’s hope so. Yet, we can be glad that, young scholar that he is, Mr. Tisby provides an accurate historical diagnosis and creative ideas, shared with what he calls “the urgency of now.” Like many others in our circle of friends and supporters, we are very eager to promote this important new book. Why not order a few and spread the word. This is a very important contribution. I cannot say too much about this as I have not yet seen it, but I am very, very excited. I have the table of contents and it looks extraordinary! As always, IVP does excellent work on racial justice and wholistic missional Kingdom stuff; this is in their Praxis line, an imprint very much about embodied best practices for the missional church. If a book is on their Praxis imprint, it is worth having. But this — this is one of those rare books that combines a deep passion for social justice and racial reconciliation and is designed to bring this big cultural assessment and Biblical vision down to the local church and its unique practices. 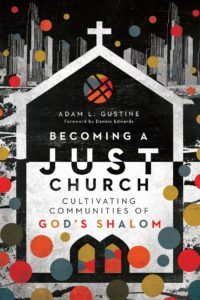 Like many in the IVP Praxis imprint, Becoming a Just Church is academically strong without being tedious — it seems like it will be readable, exciting, even. Yes, it is about ecclesiology, but it is, as the first part puts it, “an ecclesiology for justice.” If justice is “a way of life for the people of God” and we are called to be, in our social situation of exile, “a prophetic alternative” then how do we live out the hope we have? What does that kind of a church look like? What does it mean to be “gardeners of shalom” in our lives, our communities, but, in Becoming a Just Church, in our local congregation? This book, rooted well in the missional strategies Adam Gustine learned at Missio Seminary in Philadelphia (Dr. Gustine has a Doctor of Ministry degree from there) and is informed by his own deep expereince. He leads CovEnterprises, a social enterprise initiative of Love Mercy Do Justice and is the founder of Jubilee Ventures (in South Bend, Indiana.) I’m very, very excited about Becoming a Just Church so we can learn, as he puts it, to “demonstrate Manana.” I’m eager to see how we “disciple people into a shalom community.” I can’t wait to read about justice within the church and equipping people — through acts of hospitality and acts of worship and more — to be agents of God’s vision of shalom. We are pleased that Waterbrook, owned by Random House, is re-issuing this little gem to a wider public. Astute observers might notice a different one of Scott Erickson’s artworks on the cover. 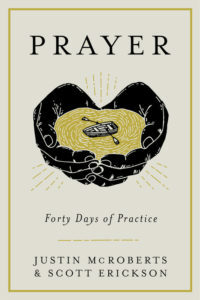 By the way, they are working on a sequel, a new hardback which will be called May It Be So: Forty Days with the Lords Prayer that should be out in the fall of 2019. You can pre-order that from us, too, ya know. I hope you know a little bit about the fascinating story and work of Dr. Pete Enns. He is a good Biblical scholar and has done some important, commentaries. His professional chops are solid. Alas, he was let go from a conservative Reformed seminary for not towing their line about absolutely inerrancy as he grappled with issues evident in careful studies of ancient manuscripts. (He wrote about his study of these problems in the Old Testament texts in his much-discussed Inspiration and Incarnation: Evangelicals and the Problem of the Old Testament.) Beneath and around this in-house discussion about how the early manuscripts are or are not utterly infallible is a bigger question and this has been Pete’s passion: what does it mean to reject the ways of knowing and certitude that science, perhaps, gives us, but that aren’t adequate appropriate for talking about, let alone experiencing, historic, warm, lively, Christian faith. Faith, of course, is more than intellectual assent to certain truths and, in the deepest Biblical and theological traditions, is more akin to trust. At Christmastime we just celebrated the very good news that God didn’t send to us a proposition, but a Person. And so Enns wrote an important book called The Sin of Certainty: Why God Desires Our Trust More Than Our Correct Beliefs. It may not be a perfect book, but it is very, very important and highly recommended. Alas, in the midst of that — defending his views of the Bible whilst losing his job as seminary prof — he wrote The Bible Tells Me So: Why Defending Scripture Has Made Us Unable to Read It. And now, after that blistering critique of wrong ways to conceive of and approach the Bible he gives us a positive, thoughtful, faith-filled way that we should engage these sacred texts. I have not seen How the Bible Actually Works yet, but I respect him and know that this is going to be much discussed. I suspect that it is somewhat similar to, but also different than What Is The Bible by Rob Bell, Inspired: Slaying Giants, Walking on Water, and Loving the Bible Again by Rachel Held Evans and, perhaps, the novel by Brian McLaren (which is coming out in a new edition in March, by the way) The Story We Find Ourselves in: Further Adventures of a New Kind of Christian. There are plenty of other books which help us grapple with the best way to read the Scriptures — I’ve got some old favs and there are some very new ones — but I mention these together as they are all written in the spirit of what we might call post-evangelicalism. Each of these authors have drifted from previous, stricter views of how to read and obey the Bible and have now embraced more narrative approaches that are perhaps more congenial to our postmodern times but, more important, more consistent with how the Bible ought to be understood and read, anyway. Could it be that maybe earlier faith communities (before the West, at least, was mired in Enlightenment-based views of knowing and a certain approach to facts) understood the Bible better than some of our most logical thinkers today. In any event, that’s what these books are exploring. They are each on a journey out of some hard places and have embraced some new ways. And, as each book shows, they love the Bible, now, more than ever. I think Dr. Enns would say that, too. 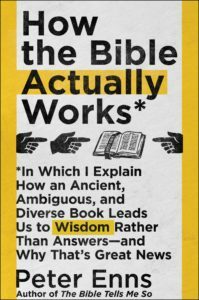 For what it is worth, he is a trained Biblical scholar and, although he writes well and this book is a popular-level exploration, he truly knows what he’s talking about. I appreciate that Enns insists that the Bible is not a rule book or instruction manual but yet a powerful learning tool that “nurtures spiritual growth by refusing to provide easy answers but instead forces readers to acquire wisdom.” I am looking forward to this and thought you, too, may want to pre-order it now. Although the cover of this maybe didn’t grab me at first, I am now convinced that the book is surely eloquent and righteous. Jamie Smith is not the only author who writes about “cultural liturgies” and while I truly adore Tish Harrison Warren’s Liturgy of the Ordinary the fact that David Dark has the forward to this upcoming new one suggests that this is something more, perhaps a more thick account of our habits and rituals and even public policies. Dark, as you may know, is a relentlessly thoughtful, literary, justice-seeking, social prophet from the South. (Thanks be to God that his wise and interesting The Gospel According to America is being re-issued in in a much updated, considerably revamped edition late March with the important new title, The Possibility of America: How the Gospel Can Mend Our God-Blessed, God-Forsaken Land (WJK; $17.00.) You can pre-order that, too, and I surely encourage you to! Dru Johnson is a young gent I’ve heard much of and I’m eager to read his words. His scholarly interests are significant and his contributions have spanned continents. Dr. Dru is an Associate Professor of Biblical and Theological Studies at The King’s College in New York City. He is a Senior Research Fellow at the Paul Henry Center (at Trinity Evangelical Divinity School) and formerly a research fellow at the University of St Andrews (working with the Logos Institute.) Holy smokes, he’s even been a Templeton Senior Research Fellow in Analytic Theology at the Institute for Advanced Studies at the Shalem Center (now called the Herzl Institute) in Jerusalem. And if all of that seems a bit stuffy, you may want to know that he was also a high-school dropout, skinhead, punk rock drummer, combat veteran, IT supervisor, and pastor. So he gets around. But he also is pretty savvy about culture, about how we engage and live into the world in which we live. Drawing on Smith’s “cultural liturgy” project, he offers us this sure-to-be acclaimed new work inviting us to think seriously about this sort of question: “What are we doing when we gather around the sacraments — or when we make the same breakfast every morning?” We are, of course, embodying rituals. And in this new book he is going to unpack and open up all kinds of insights about this formative aspects of our day to day living. 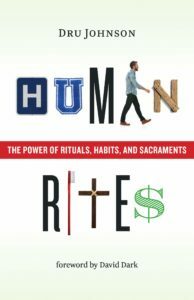 As the publisher says, Dru Johnson’s, Human Rites, “colorfully illustrates both the mundane and the sacred rituals that penetrate all of life, offering not only a helpful introduction to rituals but also a framework for understanding them. As he unpacks how rituals pervade eery areas of our lives, Johnson suggests biblical ways to focus our use of rituals ,habits, and sacraments so that we can see the world more truly through them.” It seems to me that this book is going to be a helpful witness to not only the liturgical aspects of culture, but of pointing us to a sacramental view of reality. If you like Smith or Warren, you need this. I hope you noticed my little shout out about this, ever so briefly, in the previous BookNotes newsletter. I was reviewing a book by and about the life of singer-songwriter and justice advocate and global peacemaker, recording artist and Anglican priest, Garth Hewett. 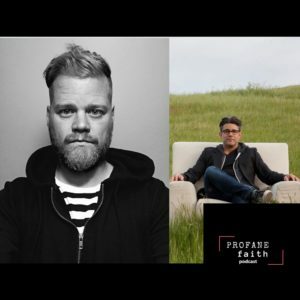 I said something about his art and his theology intertwining somehow, and that he sang about stuff that mattered and that there have been recent books about an evangelical vision for the common good that explore the same sorts of themes that Hewett sings and writes about. Theology, good theology, like healthy spirituality, must always bear fruit deepening our love for the world God so loves and equip us to be faithful in our engagement with our times. Professor Volf knows this and is an acclaimed “public theologian” whose books have this keen perception of the issues of the day and whose study yields deeper insights about being alive in and for the world. By the way, we heard of Matthew Croasmun a year or two ago when he edited, along with Zoran Grozdanov and Ryan McAnnally-Linz, a collection of essays in honor of his teacher, Miroslav Volf called Envisioning the Good Life. This summer we discovered his Upper Room book Let Me Ask You a Question: Conversations with Jesus. Nice stuff. This stunning book comes out in less than a month and we hope to alert many to it. It’s very well written and exceptionally thoughtful. I will admit, there are oodles of spiritual books that tell of the great suffering people have gone through. God helps folks cope, and it is a great grace. Some of the stories are heart breaking and heart warming. Whether they are beautifully rendered or plain, there is something moving about reading the stories of others journey into the depths and coming back out, chastened, sobered, but alive and still loving God and God’s people. I have an allergy to books which offer cliches, though, or answers that sound too easy. Some of these sorts of books about making sense of suffering tend that way and we avoid recommending them. It is hard to match the pained, spare eloquence of Nicholas Wolterstorff’s Lament for a Son or the hard-won but faithfully raw insight of Gerald Sittser’s A Grace Disguised: How the Soul Grows Through Loss. I really appreciate her shameless honesty, her devout piety, her robust faith, and mature spirituality. I liked her stories. And I commend her good scholarship — she is not just writing out of her own experience, rich and formative as it is, but she’s done the reading and thinking and processing of good Biblical and theological scholarship. How many evangelical testimonials of this sort integrate the insights about lament from, say Claus Westermann [who I first read because Brueggemann cited him so much] or the old Puritan Thomas Watson or modern thinker N.T. Wright? To see an author quoting Bono and Soong-Chan Rah and Lament for a Son and Marva Dawn and, of course, Michael Card’s Sacred Sorrow shows she’s got a thoughtful, balanced, creative, approach. To see Tim Keller and Anne Lamott in the same book makes me smile. To draw on progressive Africans like Mpho Tutu and stuffy Anglos like C.S. Lewis (and a quote from the Jeffrey Eugenides novel, The Marriage Plot) shows this is super interesting and well-edited. There is a good listing of Bible verses on which those who are suffering can draw upon. There’s a thorough guide-book full of discussion questions for personal or group use. 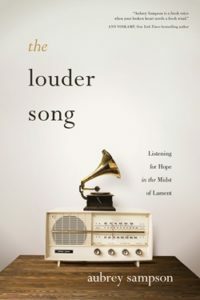 The Louder Song is a strong, important book and we highly recommend it. On sale for pre-order now.